Jennifer Caldwell is the Earth Medicine Institute’s instructor of Ayurveda. 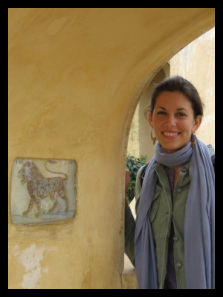 The founder and director of Open Lotus Ayurveda, Jennifer is a Clinical Ayurvedic Specialist (C.A.S.) and completed her studies in 2007 from the California College of Ayurveda and is a Practitioner Member of the National Ayurvedic Medical Association (NAMA). She has also completed intensive post graduate study with Dr. Liladhar Gupta, B.S.c, B.A.M.S. at his Dhanvantri Dham clinic in Vrindaban India. Before studying Ayurveda, Jennifer earned her Bachelor of Arts in Anthropology from the University of California at Santa Cruz. Jennifer has also completed Level One Reiki training with Reiki master Shalandra Abbey and is a Certified Reiki Practitioner. As a Clinical Ayurvedic Specialist, Jennifer is an herbalist, aromatherapist, lifestyle counselor, dietary & nutritional advisor and is a huge supporter of your success!